Egersund Net has produced fish farming nets since the early 1970ies. Over the last years Egersund Net has expanded greatly with regard to business volume as well as the number of newly established subdivisions. Egersund Net started net production in the early 1970ies and was turned into a separate company in 1996. Since then, Egersund Net has established itself as one of Europe’s leading suppliers of seine nets and services for the fish farming business. In order to optimise the quality of our products we co-operate closely with our customers and business partners. Over the last years Egersund Net has expanded greatly with regard to business volume as well as the number of newly established subdivisions. From the modest start in Svanavågen, Egersund, the company now has a number of service departments along the coast of Norway (Egersund, Austevoll, Manger, Kristiansund, Rørvik, Brønnøysund, Vevelstad, Andenes og Skjervøy) while the production of new nets takes place in the Lithuanian town Tauragé. Each of our subdivisions also keeps various types of special nets, such as roof and container nets, in store for speedy delivery. Recently Egersund Net has established a special fish farming gear shop, at Rabben in the municipality of Austevoll, offering a rich assortment of goods, such as work clothes, HSE gear, chains and mooring equipment. 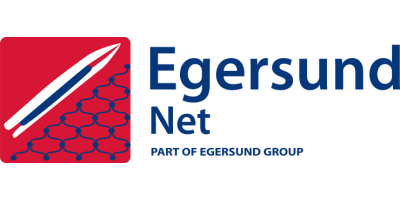 At present Egersund Net is firmly established as a safe supplier and market leader with regard to seine net technology, services and equipment for the fish farming business. AKVA group is a global technology and service partner that deliver technology and services that helps solve biological challenges within the aquaculture industry. Good operational performance and fish welfare ensures sustainability and profitability for the customer. This is the premise for everything we deliver, from single components to services and complete installations. In-depth aquaculture knowledge, extensive experience and a high capacity for innovation characterizes and enables us to deliver the best solutions for both land based and cage based fish farming.